Before Twitter, before 24-hour sports channels, long before fans watched highlight goals on their phones—long before something called a “highlight” had been invented—there was Hockey Night in Canada. It was cutting-edge technology back then. Anywhere in Canada, a hockey fan could come in from the snow, sit down by the radio, listen to a game played in Montreal or Toronto, and experience the thrill of a game played hundreds, or thousands, of kilometres away. Before all of what we call Canada had joined Confederation, even before the “Original Six,” there was Hockey Night in Canada to define both the country and the game. At first fans worried that television would ruin the game. Now Canadians can hardly imagine the game without the CBC broadcast. Hockey Night in Canada: 60 Seasons celebrates the moments, the personalities, and the innovations that have shaped our experience of the game. What would hockey be without instant replay or the “three stars”? What would it be without Foster Hewitt, Howie Meeker, Peter Puck, or mythical moments like Bobby Orr’s Stanley Cup–winning goal? What would the game be without the Saturday night double-header, or Coach’s Corner, or Bob Cole’s “Stand up and cheer, Canada!” at the 2002 Olympics? Hockey Night in Canada: 60 Seasons celebrates not only what is great about the game, but how Hockey Night in Canada has come to define it. 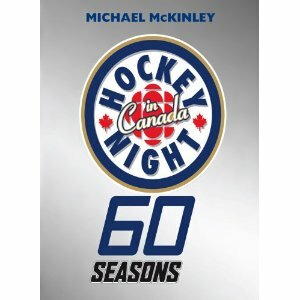 Written by Michael McKinley, author of Hockey: A People’s History, with a foreword by Ron MacLean and richly illustrated with rare on-screen and archival material, Hockey Night in Canada: 60 Seasons features behind-the-scenes glimpses into the way the broadcast was born and developed and little-known stories about the men and women who have brought our game to life in sixty fascinating moments. Interesting review, It looks like a good read. I would definitely order one!